Well, if that article title doesn't get the Search Engines all abuzz, I don't know what will. Take heed: You will not discover any great recipes on how to make your own crack in this article. It's all about scents and addiction and the positive (not negative) impact such things can have. Hi. This is Scott. Nicole's husband. You may remember me from such hits as . You're probably wondering why on Earth I'm writing an article on Bagful of Notions -- and you'd be right to do so. It all comes down to crack. 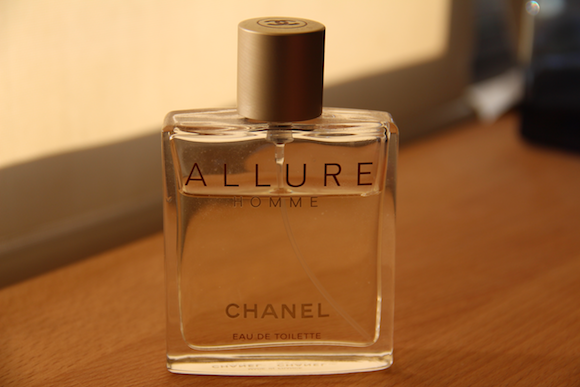 No, not cocaine, but, Allure from Chanel, a scent for men which Nicole bought for me for Christmas 2011. I'm not much into scents, other than trying to ensure I don't smell bad, so like any good husband, when Nicole supplied something as a gift that she thought would "fit" me as a scent, I was more than happy to give it a go. Those of you who are into these things know that an individual's body chemistry can dramatically effect perfumes and colognes. What smells great on a piece of paper in the shop can smell dreadful when on certain people. So buying a scent for someone else to wear can be quite a challenge (thankfully, Nicole has been quite happy with the ones she has got from me). When Nicole had a whiff of Alure in the shop, she knew she liked it, but would it work when added to Scott? Indeed, Nicole likes it so much that we've begun calling it "crack" as a bit of a joke. Simple, to the point, and doesn't look like a fist, or a torso, or anything else -- it looks like a simple, clean-lined bottle. No Comic-Sans font, no graphic of a man atop a horse. It speaks what it speaks through the nose, and that's really what a scent should be about. Finding the right words here isn't easy. 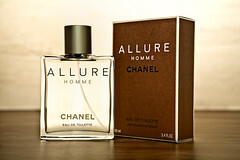 Allure is not like a lot of other male scents that I've encountered wandering through the department stores with Nicole. It's doesn't shout "douchebag banker" as so many do. It doesn't shout "I'm trying to cover up some other, atrocious, smell" either - it is sharp, crisp, vibrant, but not floral. It reminds me of walking through a spice market in North Africa, and every now and then catching a whiff of some dried weeds or grasses. I'm much better at describing wine or a woman's perfume - after the initial spritz that I may use in the morning, the smell quickly fades to my nose. It blends well with "me" and that's part of what Nicole likes so much. Do I like it? Yes, absolutely. The fact that Nicole likes it is even better. I won't give this a Bagful Breakdown, that's up to Nicole to do, but I will say this: Once this bottle is used up, I guarantee we'll be buying it again. Well done, Chanel!